These 60 second video tips are appropriate for adults and children. Many people are using them as self improvement tools. Get your flatmates and family in on the tips so the entire household can reap the rewards of positive action. 60 seconds! Sometimes that's all it takes. Receive one video each week along with awesome subscriber bonuses throughout the year. These bonuses could be an mp3 audio meditation download or a worksheet or exercise to go with the self healing tip. 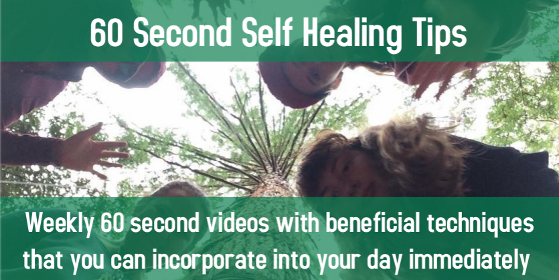 For the most beneficial results for your health, your body, your mind and your life, I recommend you aim to use each video tip at least once every day for the week that follows because this will give a little time for you to see if it resonates with you and provides you with some positive outcomes. When the next video comes along, apply that tip for the week ahead - and so on. You will notice after a while that you will have your favourite techniques and they will soon become a very useful habit and a part of your beautiful new positive lifestyle. Simply enter your email address below! Check your spam and junk folders for an instant reply and enjoy one years worth of free healing tips for your health, your body, your mind and your life! Unsubscribe at any time.